Description: A better look of the small steamers out side the round house. 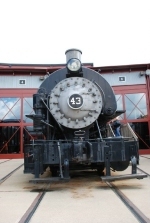 Description: Two tank engines sit on display in the central core at Steamtown. Description: Vulcan 0-4-0 built in Wilkes-Barre, PA in 1919 sits at Steamtown in Scranton. Description: New Haven Trap Rock Company 0-4-0T 43 on display in Steamtowns roundhouse.